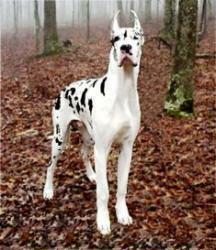 The Great Dane is a very old breed, known as the “Apollo of all dogs”. Dogs resembling the Great Dane have appeared on Greek money dating back to 36 B.C. There were also drawings of these dogs on Egyptian monuments from around 3000 B.C. Danes were admired for their ability to bring down bear and wild boar. They were thought to have Irish Wolfhound mixed with Old English Mastiff. With selective breeding the Greyhound was added in to create the Great Dane. Besides being used as a hunter, they were also used as estate guard dogs. The Great Dane has a good disposition, often called a “Gentle Giant.” Charming and affectionate, they are playful and patient with children. They love everyone and need to be around people. The Great Dane does not bark much and only becomes aggressive when the circumstances require it. They are reliable, trustworthy and dependable. Courageous and loyal, they are good watchdogs. The Great Dane is a giant and powerful dog. The weight varies between males and females. males can weight 120-200 lbs and a female 100-130 lbs. Their life expectancy is about 10 years but can live up to 12-13 years. They are prone to hip dysplasia, bloat, heart disease, tumors and tail injuries. Jogging is not recommended until over a year old, but walking is necessary.